The Canon EOS 6D DSLR camera is a travel-friendly DSLR that sits below the Canon 5D Mark III DSLR camera in the EOS line-up. Compact and lightweight, the Canon 6D has a powerful full-frame imaging system and superior low-light performance. Features include: a 20.2-megapixel CMOS sensor; DIGIC 5+ image processor; an 11-point AF system; Wi-Fi and GPS connectivity; and expandable ISO from 50-102800. 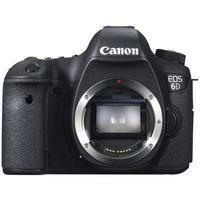 Canon Eos 6d Body " 5 Thousand Releases+Bg-E13 " Canon Specialist Retailer "